Bloody Point is located off the southern end of Kent Island that is found on the eastern shore of Maryland. The bridge from Annapolis touches down there. 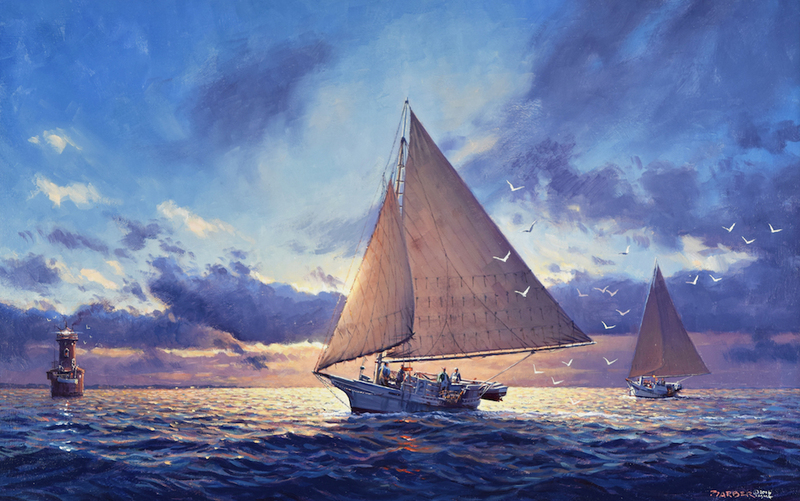 The skipjack is the Esther F that we see sailing up from Tilghman Island to the south in search of oysters. The lighthouse was first lit in 1882 and still warns mariners off the shoal there. The origin of the name Bloody Point is lost to history with explanations such as pirates being hanged there or the massacre of Indians by colonists in 1652. The skipjack was built in 1954 and dredged oysters in the Chesapeake until she was broken up in 2009. I saw her working in these waters in the early 1980s. 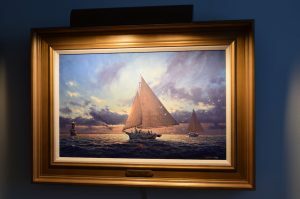 The painting is beautifully framed in a goldtone museum-grade molding bearing its hand- lettered nameplate. 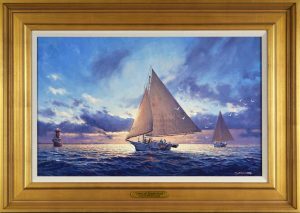 “Dawn off Bloody Point” is fitted with an elegant House of Troy painting light.